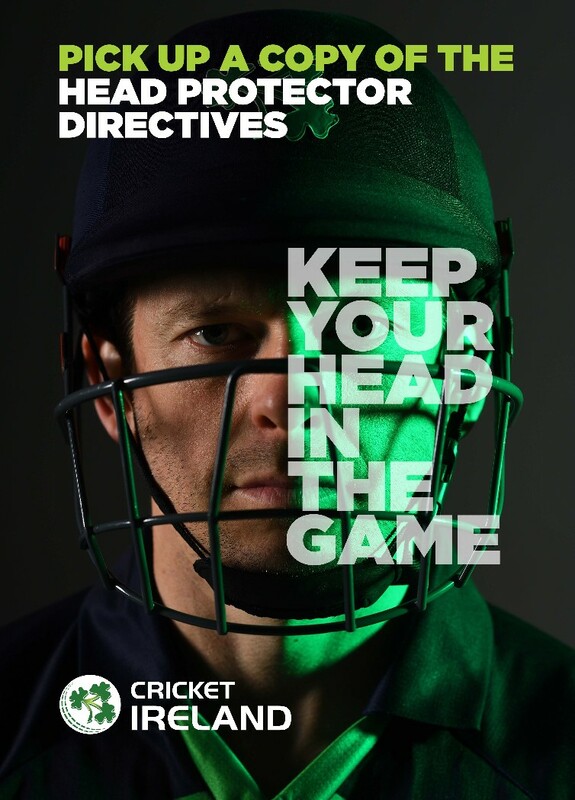 Cricket Ireland have released guidance on Head Protection and Head Protection Directives which have been circulated to the various Unions. These Regulations shall apply to all cricketers undertaking any Regulated Activity for any team in matches for any Ireland international team in any of its matches (including Men’s, Women's,Wolves and U19 teams); Inter-Provincial Series matches; and in Women’s Super 3s matches. “Relevant Participating Cricketer” shallmean any player participating in a Match for a relevant teamas detailed in Regulation 2, including but not limited to any substitute fielder. Fielding in a position closer than 8 yards fromthe batsman’s position on the popping crease on amiddle stump line,with the exception of any fielding position behind square of thewicket on the off side. b. in the event that a Relevant Participating Cricketer fails towear a head protector or (forwicket-keepers only) a facemaskwhen seeking to undertake a Regulated Activity, theMatch umpires shall not allow the Match to continue. 5. A head protector or facemask shall not be deemed to be Compliant Headgear if it is altered in anywaywhich is inconsistentwith any guidance or instructions provided by the relevantmanufacturer or in awaywhich otherwise reduces the safety protection provided by the relevant head protector (for example, the removal of the chin-cup) or face protector. 6. It shall be the joint responsibility of each Relevant Participating Cricketer and Provincial Union or club (as applicable) forwhich he/she plays to ensure that he/shewears Compliant Headgear at all timeswhen undertaking any Regulated Activity in anyMatch. Notwithstanding the umpire powers pursuant to Regulation 4, in the event that a Relevant Participating Cricketer is alleged to be in breach of Regulation 3 or fails to act immediately on an umpire’s instruction to wear a head protector or facemask (as applicable) pursuant to Regulation 4, the Relevant Participating Cricketer and his/her Provincial Union, teamor club (as applicable)may be referred to the CIDC for disciplinary proceedings in accordancewith the CIDC Regulations. In addition to themandatory requirements on Relevant Participating Cricketers in Matches under these Regulations, it is strongly recommended that all Relevant Participating Cricketers and their coacheswear Compliant Headgear in any practice environmentswhich are similar or equivalent to any of the Regulated Activities (includingwithout limitation the throwing or feeding of practice balls to a batsman fromless than the length of a pitch). The purpose of this brief note is to assist Leagues and Clubs at the recreational level to understand these changes andwhat theymean. CI and all Provincial Unions strongly recommend that all adult recreational cricketers shouldwear a head protector for certain activities, preferably which meet themost recent British Safety Standard (see below). This recommendation applies to batting against all types of bowling,wicket-keepers standing up to the wicket (whomay as an alternativewear face protectors) and fielders fielding closer than eight yards fromthe batsman’smiddle stump, except behind the wicket on the off side. [Refer to laws of cricket regarding head protectors and consequences of noncompliance]. The position in relation to U18s currently remains unchanged, and is governed by CI’s ‘Young Cricketer Directives’. In essence all batsmen, andwicket-keepers standing up to the stumps,mustwear head protectionwhen playing or practising. That Directive should be referred to in full for the position in relation to U18s. The latest British Safety Standard is BS7928:2013 (for both adults and juniors). The full list of helmets/head protectorsmeeting this standard is available at www.ecb.co.uk/helmets. For wicket-keeping face protectors, the relevant British Safety Standard is BS7929-2:2009 (again, for both adults and juniors). CI understands that there is currently no specific women's head protector and as a consequence no specific standard forwomen's cricket head protector. As the size of the standardwomen's cricket ball is between the standardmen and junior balls, it is recommended thatwomen use head protectors that have been tested against both themen's and junior sized ball, or at least against the junior size ball (as that could potentially get through the gap above the face guard on amen's head protector). What do Leagues and Clubs need to do? Whilst it is strongly recommended that all adult recreational cricketerswear head protectors in the on-field circumstances detailed above, it is notmandatory for themto do so. For the avoidance of doubt, Leagues or Clubs do not need to go above and beyond CI’s recommendation by forcing their cricketers to wear head protectors. However, Leagues and Clubs in recreational cricket should ensure that their cricketers aremade aware of CI’s above recommendation in relation to head protectors, including the need to check that any newly purchased head protectorsmeet the latest British Safety Standard. CI recommends that Leagues and Clubs bring the link above (i.e www.ecb.co.uk/helmets) to the attention of their cricketers and encourage all cricketers to carefully consider their own health and safety regarding head protector use. Leagues and Clubs should always ensure that they have adequate public liability insurance.